BISMARCK, N.D. — Developers of a $3.8 billion, four-state oil pipeline sued in federal court Monday to stop protesters near an American Indian reservation in North Dakota from interfering with the project, alleging the safety of workers and law enforcement is at risk. Dakota Access LLC filed a lawsuit against Standing Rock Sioux Tribal Chairman David Archambault II and other protesters, seeking restraining orders and unspecified monetary damages. The protesters "have created and will continue to create a risk of bodily injury and harm to Dakota Access employees and contractors, as well as to law enforcement personnel and other individuals at the construction site," the company wrote in court papers. Archambault was among several protesters charged last week with disorderly conduct or criminal trespass at the construction site near the Standing Rock Sioux reservation that straddles the North Dakota-South Dakota border. The tribe sued federal regulators late last month for approving the pipeline, which will take crude oil from the Bakken oil fields in North Dakota to Illinois and cross the Missouri River just upstream of the reservation. The tribe argues the pipeline would disturb sacred sites and affect drinking water for the thousands of residents on the reservation and the millions who rely on it downstream. Dakota Access said in court papers that threats have been made to workers, and rocks and bottles have been thrown, and that Archambault excused tribal employees from work last week to protest the pipeline's construction. Archambault told reporters Monday that he was arrested for "doing what everybody else was doing: demonstrating." He said he expected more arrests and acts of civil disobedience to continue, calling the pipeline "a black poisonous snake" that "is made from nothing but greed." Workers accompanied by armed private security guards started construction on the project near the reservation last week. Several sheriff's deputies and about 30 North Dakota Highway Patrol troopers were on site Monday, and the highway patrol asked motorists to avoid a state highway near the reservation because of the protests. 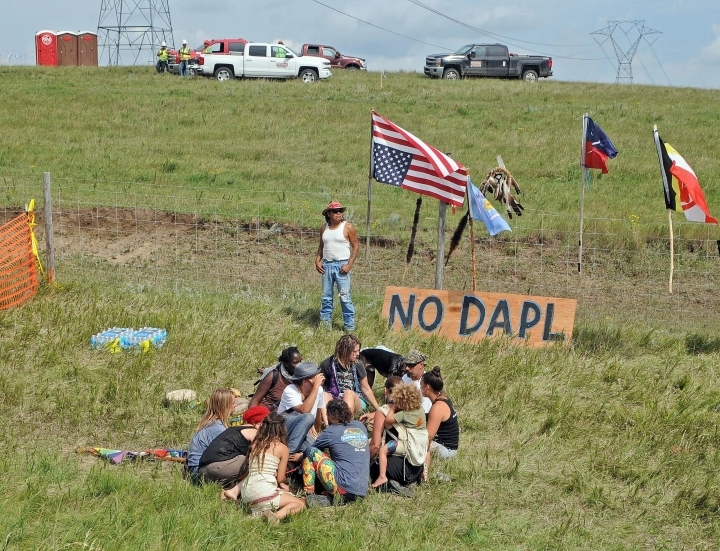 Texas-based Dakota Access claims the protesters are causing the company "to lose goodwill among its customers" because of delays and are "diminishing" its "opportunity to complete construction of the pipeline's water crossing before its permits expire."